"Norwegian Wood (This Bird Has Flown)" also known as simply "Norwegian Wood", is a song by The Beatles, mainly written by John Lennon, with the middle eight co-written with Paul McCartney, released on the 1965 album Rubber Soul. It was the first example of a rock band including a sitar in one of their songs, played by lead guitarist George Harrison. 1.- Syntheway Virtual Sitar is a VST instrument designed to emulate the Indian Sitar. 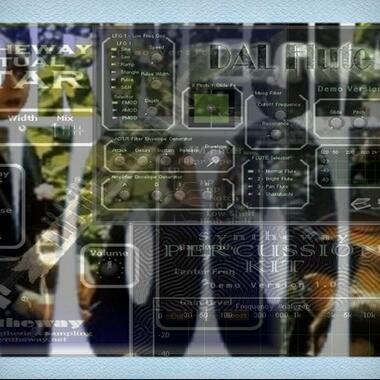 2.- DAL Flute VSTi Description: DALF is a virtual woodwind instrument combining multi-samples of real flutes with a Digital Signal Processing (DSP) engine. Offers control over several parameters allowing you to sculpt new and interesting sounds. - Hybrid Synthesis that combines sample-playback engine with native DSP processing. - Powerful multi-mode filters, envelopes, and LFOs give a wealth of creative possibilities. - Flute Selector: Normal, Bright, Pan Flute (Panpipe) and Shakuhachi modes. - 32 presets redesigned in a wide range of styles: 8 for each mode: Normal, Bright, Pan and Shakuhachi. - Hybrid Method combines mastered multi-samples, normalized and noise-reduced. Based on PCM (Pulse Code Modulation) recordings of real flutes. Full length sustain samples, no loops (natural decay), stored in 16 bits and 44.100 KHz and Digital Signal Processing (DSP) engine. 3.- Syntheway Percussion Kit VSTi: is a collection of percussion instruments designed for creating Orchestral Percussion, Auxiliary Percussion, Mallet Percussion, Latin Percussion and African Percussion. 4.- Fantasize is a sample generator that works with the SoundFont v2 files (SF2), designed for creating music on your VST Host.